This 17 piece lockpick tool set is a perfect size to carry in your shirt pocket. Picks included are the standard choice of the industry. Each pick is made of hard finished clockspring steel, tempered to the correct degree of hardness. Includes a metal over handle. This allows you to actually prolong the life of the picks. You insert a pick and tighten the set screws to keep it in place. Then you won't be as likely to bend the pick out of shape. Bending the pick out of shape is very easy to do with this set. This is a generic import and therefore not for professional use. For occasional hobby usage its fine and will allow you to get familiar with the most popular pick shapes and their function. Using the included pick holder will help prolong the life of your set and make picking easier. Lockpicking is a skill. It may take practice to learn how to use these items effectively. As a result, due to the nature of these products, there will be no refunds for lock pick equipment. 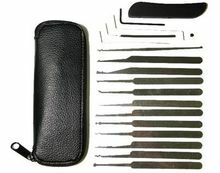 We also have the professional quality Southord line of lock pick sets and products on this site. Sorry, gift cards, unregistered prepaid cards or International(non-USA) Cards are not accepted.. Orders with these will be cancelled.